The Greek of Revelation 21:1 speaks of one world “passing away” so that a remade world may take its place. 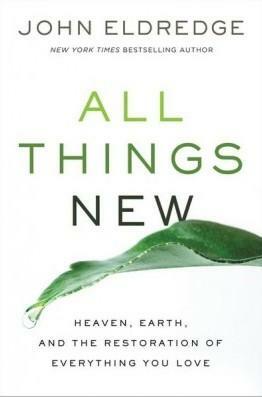 Therefore Eugene Peterson in The Message translates the passage, “I saw Heaven and earth new-created. Gone the first Heaven, gone the first earth, gone the sea.” Gone only in the sense of the old passing, so the renewed can take its place. The eagles carried Sam and Frodo to safety; Gandalf rode them several times. What if? A large golden eagle in our world can lift a sheep and carry it away. What load can a renewed eagle bear? I would love to ride a golden eagle, with their permission of course. And, friends—I have not even mentioned the angels. Heaven comes to earth, and the angels shall walk in fellowship with man. What do the angels have to teach us? What sort of games do they play? The entire earth will be our playground. I see massive games like lacrosse being played by angels and men across vast landscapes. This is why you don’t need a bucket list. It’s all yours, and you can never lose it. Oh, how I long to wander the beautiful places, without a curfew, without the end of vacation always looming. You’ve longed to see the fjords of Norway? Done. You’ve secretly hoped to wander the jungles of Africa? Yours too. What next? The Amazon? Antarctica? And I am only touching on the earth. What of the microscopic world? It is as vast as the world we call our own, and we shall explore its mysteries. What of the heavens? They, too, shall be ours. Good thing we have all the time in the world that has no time to explore and come home and tell the tales. To take up new adventures with those who want to sail the seven seas or climb the peaks of the Andes or range the universe itself. You think I am being fanciful. I am being utterly serious. I am being as serious as Jesus when he warned that only the child-heart can receive the kingdom. Do you really want to suggest sinful man can create stories and worlds that outshine the worlds God will remake? Careful there. “No eye has seen, no ear has heard, and no mind has imagined what God has prepared for those who love him” (1 Corinthians 2:9 NLT). It was our creative Father who gave us our imaginations; the “visions” we tell in story are often prophetic glimpses into his wondrous realms, and his creative majesty will certainly do ours one better in the world to come.